MedSurg Notes: Nurses Clinical Pocket Guide reference book. - - OS. 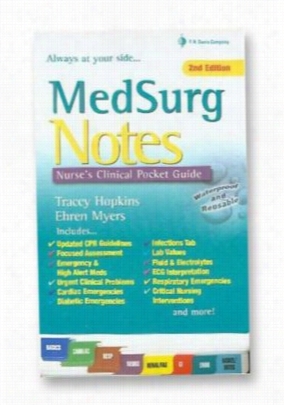 MedSurg Notes: Nurses Clinical Pocket Guide reference book by Tracey Hopkins and Ehren Meyers. This guide provides succinct, on-the-spot guidance for caring for patients with complex medical-surgical conditions! 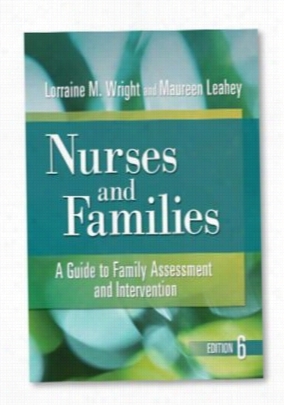 Rely on this handy guide for focused assessments, immediate interventions, and follow-up care for patients who develop complications-all presented from the nurse's point of view. The completely revised and updated 2nd Edition features an enhanced tab structure, assessment how-to's, delegation and critical thinking guides, expanded coverage of pain management and emergencies, and more lab and diagnostic tests. Flowsheets provide space for recording frequent vital signs, serial lab values, stat meds, and interventions. From setting up an oxygen delivery system in a hospital room to administering stat meds, this handy, pocket-sized resource helps nurses to deliver high-quality care. It covers advanced nursing procedures and concepts associated with 65 urgent clinical situations. It uses a systems approach and is organized by symptom and medical diagnosis. It includes an A & P Snapshot of the associated system in each section-12 in all. Each clinical situation includes a focused assessment tool. It offers guidelines for delegation and documentation. It reviews IV therapy, including indications for crystalloids, colloids, or blood Products administration. It is HIPAA and OSHA compliant-helps to write directly on the pages to temporarily record clinical data and then wipe them clean with alcohol. Spiral bound. 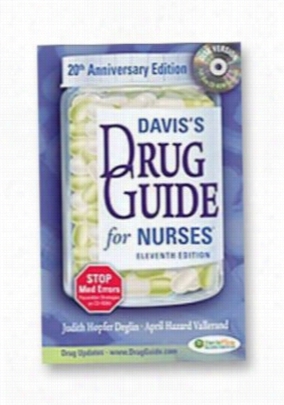 Davis Drug Guide nurses reference book with CD ROM. - - OS. Davis Drug Guide is a comprehensive drug reference Book with weight base dosage calculation instruction. The user can review the integrated critical care infusion calculators for many critical care medications. The guide includes over 5000 trade and generic drugs, nearly 140 drug classifications, over 1700 drug monographs, 700 commonly used combination drugs, and 400 integrated calculators. Extensive cross-linking has been implemented between drugs, and users can search Main, Generic, Trade, Therapeutic, Pharmacologic, and Eye Medications indexes. Eleventh edition soft cover book includes CD ROM. LPN Notes: Nurses Clinical Pocket Guide reference book. - - OS. 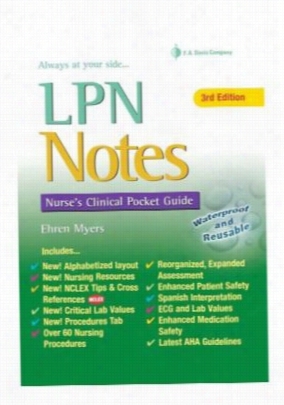 LPN Notes: Nurses Clinical Pocket Guide reference book by Erhen Myers and Tracey Hopkins. Pocket-sized flip chart contains commonly used critical information, charts, graphs, formulas, conversions, and lab values, for safe and efficient nursing care. Pages are waterproof with write on/wipe off surface. Includes specialized assessments in mental Health, gerontology, and pediatrics. Also lists community resources. Spiral bound. Second Edition. 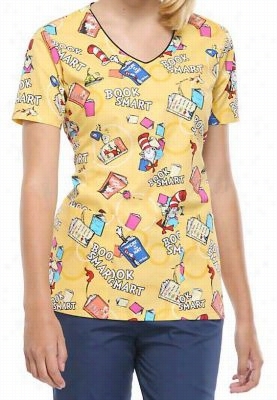 Cherokee Tooniforms Book Smart v-neck print top. - book smart - XS. Activity Book W Temporary Tattoos - Dollars And Sense. 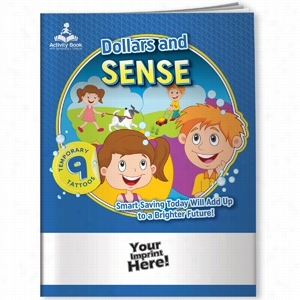 This book is filled with activities, games, and coloring pages that help kids learn the value of saving for tomorrow. It teaches kids all about banks, checking and savings accounts, credit cards, and other important financial tools. Children can learn about important topics while expressing their creativity with these engaging and informative activity books. Through their interactive storylines and activity pages, kids will learn about healthy eating, calling 9-1-1, and fire safety. Each book contains 20 activity-filled pages, plus a full page of full-color temporary Tattoos. Storylines teach valuable lessons in fun ways! Characters come to life in temporary tattoos kids can wear everywhere! 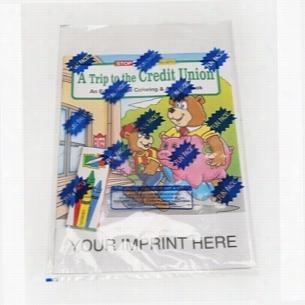 COLORING SET - A Trip to the Credit Union - Coloring Book Fun Pack. 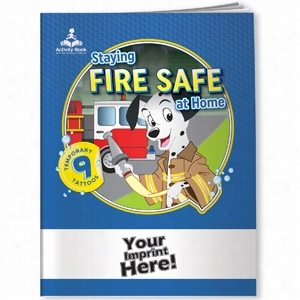 Activity Book W Temporary Tattoos - Staying Fire Safe At Home. Stop, drop, and roll! This Book is full of fun activities that teach Kids what to do during a fire. It includes tons of important info from creating an escape plan to getting out of the house safely. Children can learn about important topics while expressing their creativity with these engaging and informative activity books. Through their interactive storylines and activity pages, kids will learn about healthy eating, calling 9-1-1, and fire safety. Each book contains 20 activity-filled pages, plus a full page of full-color temporary tattoos. Storylines teach valuable lessons in fun ways! Characters come to life in temporary tattoos kids can wear everywhere! Activity Book W Temporary Tattoos - Don'T Throw It Out, Recycle. Where does the trash go when you throw it away? 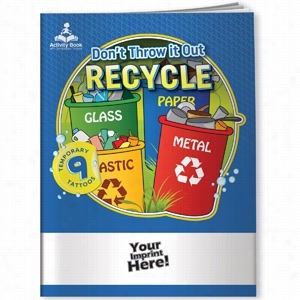 This activity-packed Book teaches kids fun facts about recycling, and offers tips to help them launch their own recycling program right at home! Children can learn about important topics while expressing their creativity with these engaging and informative activity books. Through their interactive storylines and activity pages, kids will learn about healthy eating, calling 9-1-1, and fire safety. Each book contains 20 activity-filled pages, plus a full page of full-color temporary tattoos. Storylines teach valuable lessons in fun ways! Characters come to life in temporary tattoos kids can wear everywhere! Activity Book W Temporary Tattoos - How & When To Call 9-1-1. 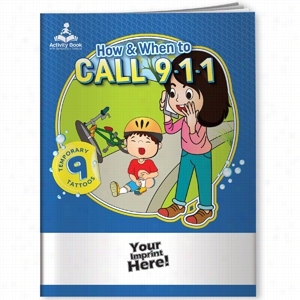 This book uses fun to teach kids the importance of dialing 9-1-1 in an emergency. Through games and activities, kids learn when they need to dial, and how to talk to the dispatcher when they call. Children can learn about important topics while expressing their creativity with these engaging and informative activity books. Through their interactive storylines and activity pages, kids will learn about healthy eating, calling 9-1-1, and fire safety. Each book contains 20 activity-filled pages, plus a full page of full-color temporary Tattoos. Storylines teach valuable lessons in fun ways! Characters come to life in temporary tattoos kids can wear everywhere!